I read once that most men take better care of their cars than they do their bodies. I can relate. For years, I had trouble sleeping. I snored loudly, tossed and turned and got up numerous times to go to bathroom. It got to the point where my wife had to wear ear plugs to sleep in the same room with me. I did nothing about it. I knew it was not good for my health. I ignored the problem. This past year, I decided to do something about it. It was a multi-step process, but I finally did connect with Mr. Sandman. I now sleep soundly and quietly each night. After talking to friends and others and reading up on sleep and sleeping disorders, I realized I could be suffering from obstructive sleep apnea, which is characterized by pauses or interruptions in your breathing while sleeping. The result is often loud snoring. It’s common in people who are overweight, but it’s a condition that can affect anyone. I found out that those who ignore or refuse to treat sleep apnea or other sleep disorders suffer the risk of high blood pressure, heart attacks, arrhythmia (irregular heartbeats), stroke, obesity, diabetes – even depression. That’s all in addition to increasing their chances of having work-related or driving accidents. A recent study funded by the National Heart, Lung, and Blood Institute found testosterone levels dropped significantly in men who don’t get enough sleep—equivalent to aging 10-15 years. These lower levels affect more than just the libido as testosterone deficiency is also linked to lower energy, poor concentration, fatigue and decreased strength. I contacted my doctor and made arrangements to spend the night in a sleep lab, where they wired me up with all sorts of electrodes and monitored me for a night. I wrote about the experience earlier in this blog. 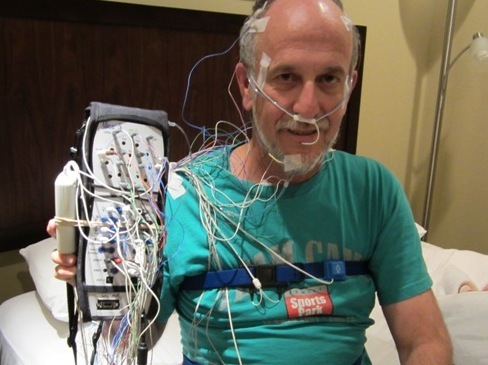 It was told afterward that I had “positional” sleep apnea. At one point during the night, I stopped breathing 87 times during an hour and half period when I was on my back. The snoring also increased dramatically when I was on my back. When I turned on my side, though, the snoring and the apnea stopped. Afterward, the doctor suggested a low-cost solution. I began sleeping with a tight-fitting T-shirt and stuffed a tennis ball inside it, positioning the ball on my upper back. The idea was that whenever I slept on my back it would be uncomfortable and I’d automatically turn on my side. It was also determined that I had involuntary twitching of my legs at night. The doctor prescribed a medication for that. The tennis ball and the anti-muscle twitch meds worked temporarily, but then I got hit with a series of sinus infections. We’re talking five in a row. The snoring and restlessness each night came back with a vengeance. The antibiotics would beat the infection down, but in a couple of weeks it would come roaring back. I was constantly feeling tired and emotionally spent. X-rays were taken. The doctor was surprised to see that both my lower (mandibular) sinuses, even after all the antibiotics, remained completely packed with something, which was unusual. He recommended surgery. The surgery was highly successful. On the way in, the doctor fixed my deviated septum (the result of breaking my nose in high school). He widened the passageways to both of the lower sinuses and cleaned them out. He found they were both packed with black-colored, gooey, fungus that was later determined to contain all sorts of bad bacteria, including strep. Yuck! With a straightened out nose and reamed out sinuses, you’d think my sleeping woes would be over. To my disappointment, after the sinus surgery and recovery, the snoring and restless sleep returned. I returned to my doctor, resolved that he was going to put me on one of those CPAP (Continuous Positive Airway Pressure Machines) to cure my sleep problems. A CPAP machine has a mask that covers your nose and mouth. The mask is connected by a hose to a machine that supplies constant oxygen throughout the night. The machine increases air pressure in your throat so that the airway in your throat does not collapse when you breathe in. My insurance didn’t cover the cost of a CPAP machine, because I was a borderline case. My doctor offered an alternative. 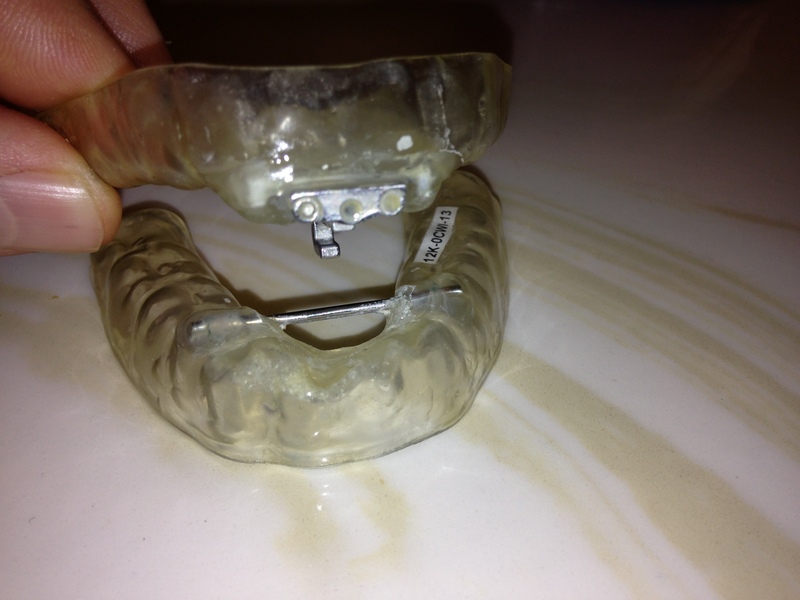 He had a local orthodontist fit me for a plastic, anti-snoring mouth piece. It was a little uncomfortable at first. I drooled during certain sleeping positions. I woke up sometimes with my jaws feeling a little sore, a condition that was corrected with yet another mouthpiece that I had to wear for an additional five minutes each morning. Bottom line: It worked! In recent months, my snoring has decreased dramatically. I’m sleeping sounder, longer and waking up feeling mentally and physically restored. I’m also dreaming. Dreams occur during deep, REM (rapid eye movement) sleep. I hadn’t been dreaming for years. Imagine that. There’s been one more positive result. My wife is sleeping soundly next to me each night – without ear plugs. Good one, finally it all got resolved.